While it is true that you’ll need a Kinect to play FRU, thankfully there are no sports or dancing to be found here. Instead, this is a puzzle platformer with an excellent concept. 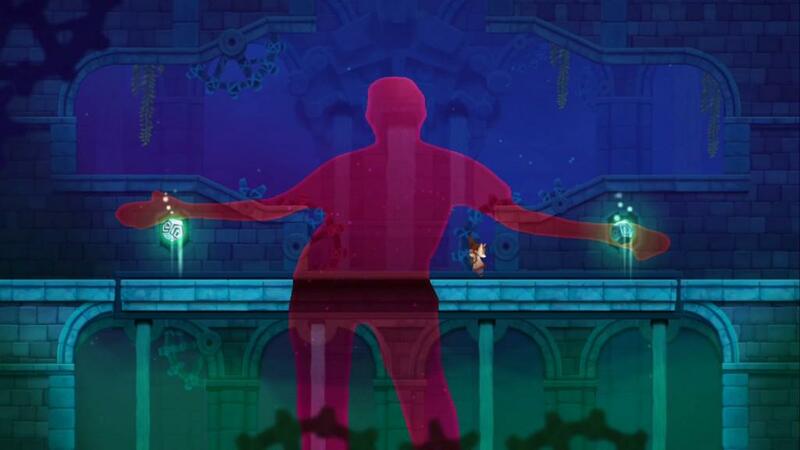 Each of the levels consists of one platforming stage layered over another with your silhouette, monitored by the Kinect, acting as a gateway between them. Physically moving yourself around the room will reveal platforms, obstacles and even bodies of water on screen which can be pulled into and out of existence as and when required to reach the goal, and the obligatory collectibles. Meanwhile, either of the analogue sticks on the controller can move the masked protagonist and both of the triggers make her jump, meaning that the controller can be held in either hand so as not to restrict your movement. If you’re feeling particularly lazy, a second person could even be enlisted to do all the moving while you recline on the sofa or vice versa. Now you might think, as I did, that such a straightforward control scheme would belong to an easy game, existing only to show off the parallel worlds concept, but then we’d both be wrong. While its platforming is indeed simple, positioning your outline to create paths can be a bit trickier, and it’s when FRU demands both at once that a real challenge appears. You’ll be squatting, waddling, stretching, and lying on the floor before you reach the finale, all while jumping a little fox girl around some ruins. Imagine a game based around scratching your head and rubbing your stomach at once and you’ll get the gist. There’s an extra layer of difficulty on offer here too if you want to unlock the bonus mode, requiring the collection of every one of the 24 hidden golden masks. 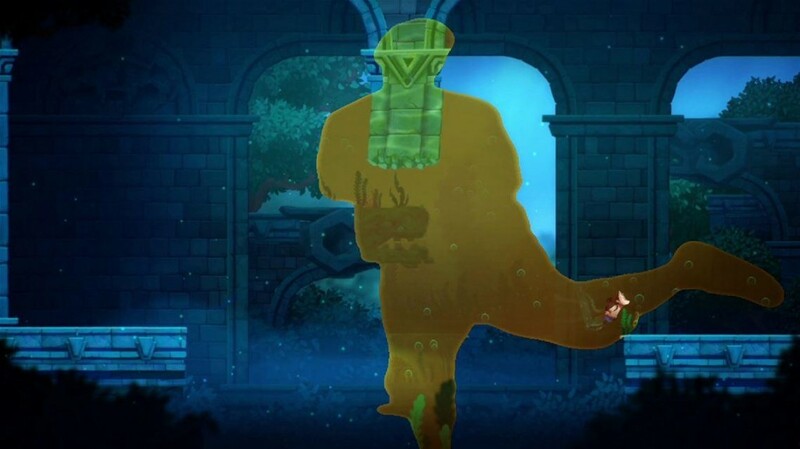 Each of these is positioned such that you’ll have to work to reach it and some are even invisible outside of the silhouette portal. The effort is rewarded, though, with the playable prototype game, originally created in just 48 hours at the Global Game Jam in Breda. As one of, if not the first title to utilise both the motion sensing of the Kinect and the classic controller setup simultaneously, the control scheme alone makes Fru a unique and worthwhile experience and its simplicity means that even a gaming novice can pick it up and understand immediately. Not only that, but it’s easily the most fun I’ve experienced using Kinect since it came bundled with the console. That two-year-old sensor was, in fact, my greatest hurdle during the four-hour adventure, as it would arbitrarily turn itself off and on again mid-level. Impressively though, the game itself never faltered in its tracking. The fun is just about maintained throughout too. Each of the four chapters puts a slight twist on the portal idea, switching it up just as the mechanics begin to feel lethargic. One chapter will have you forced to make and hold poses to activate switches while one requires quick thinking and movements to keep the hero safe from lava but all will have you moving in ways you never thought possible while playing a game. Completing each chapter also earns you a fragment of the very vague story, providing a satisfying finale to each section and the game but leaving a great deal to the imagination. The depressing thing about FRU is that it demonstrates what motion sensing games could have been with a bit more effort and imagination put into them. It is with a heavy heart that I now return the Kinect to its duties as my voice activated TV remote, but perhaps it’s fitting that the (likely) final game for the motion sensor is the very best one.